Lake Taneycomo is the area of the White River below Table Rock Lake and Dam near Branson. The cold water released from the dam has created nearly 23 miles of trout fishing waters. Each year the area receives about 75,000 rainbows and 10,000 browns from nearby Shepherd of the Hills Hatchery. The upper 3 miles, from the Dam to the mouth of Fall creek is Trophy Trout Management Area. Here rainbows less than 12 inches or greater than 16 inches can be kept. Brown trout must be at least 20 inches long. 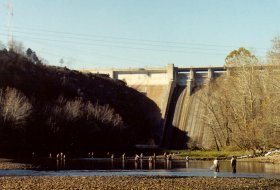 The remaining 20 miles is a Regular Trout Management area. In this section, there is no length limit on rainbows. Brown Trout must be at least 20 inches. Sampling conducted in 2001 indicated that 30% of the rainbows were over 13 inches and 7 % were over 16 inches. Of the browns sampled, 2% were over 20 inches. One brown collected was 36.5 inch long and had a 28½ inch girth! Taneycomo has world record size brown trout! greatly depending upon generation. Exact periods of generation can not be predicted.